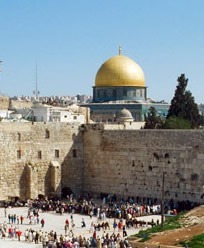 Upon arrival to airport meet our representative and transfer to hotel in Jerusalem for overnight. 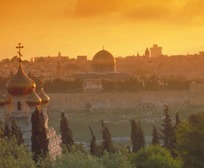 Drive to Mt Scopus for a view of Jerusalem, then to the Garden of Gethsemane and Church of the Agony. 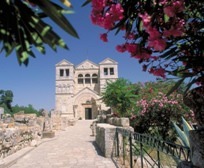 Drive to Mt Zion for a visit to the tomb of King David, the Room of the Last Supper and Dormition Abbey. Sightseeing in the new city including the Israel Museum, the Shrine of the Book, with the famous Dead Sea scrolls, new Supreme Court bld. Mtí Herzl and Yad Vashem (the memorial to the six million Jews who were killed in the Holocaust). Then visit the model of the Heordian city of Jerusalem dating back to the time of the Second Temple. Visit the synagogue with Marc Chagall stained glass windows at the Hadassah medical center, then via Ein Karem (the birth place of John the Baptist). Walk through the Jaffa Gate to the City: the renewed Jewish Quarter, the Western Wall, the Temple area, the colorful bazars, Via Dolorosa, and the Church of the Holy Sepulcher. Continue to Bethlehem (subject to security clearance) to visit Rachel's Tomb and the Church of the Nativity and return toJerusalem for overnight. Depart Jerusalem via Jericho (subject to security clearance), the oldest city in the world. Explore the excavations of the beautiful Roman City of Beit Shean. 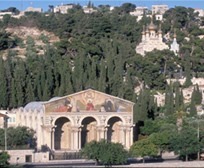 Continue onto Nazareth to see Mary's Well and visit the Church of Annunciation. Drive to Safed - city of Mystical Judaism for a walk through the artists colony. Ascend the Golan Heights and from Mt. Bental, peer deep into Syria and the ghost town of Kuneitra. Explore Caesari of Philippi at the Banias Springs. Drive along the shores of the Sea of Galilee to Capernaum to visit the ruins of the ancient synagogue. See the beautiful church at Tabgha where the miracle of the fishes and the loaves took place. 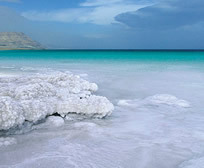 Enjoy a short tour of Tiberias - the old centre of Jewish learning. Depart for Acre (Akko) to explore the Knights' Halls and the secret Crusader tunnels, then to Haifa to view the magnificent Bahai gardens from atop Mount Carmel. 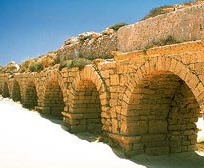 Stop at Caesarea, to visit the Roman Theatre and the Crusader Fortress. A day at leisure in Tel Aviv. Any extra meals or beverages or hotel extras. Please enquire below or call 02 9371 8166 to book your trip today!